Singer and television star Jenni Rivera passed away when the small aircraft she was traveling in crashed in Northern Mexico, her family has confirmed. There have been conflicting reports about the total number of people aboard the plane. Rivera's brother has said there were a total of six people: His sister, her publicist, her lawyer, two pilots, and a family friend. The Civil Aviation Authority of Mexico, however, has reported a total of seven passengers. Rivera's plane, a 43-year-old Learjet 25, had been in a previous accident in 2005, when it experienced a fuel system malfunction, resulting in one wing weighing more than the other. In addition, Univision News discovered that the plane's pilots had logged more than 19 hours on shift, violating commercial airline regulations. Last night, Mexican daily El Universal reported that the performer's driver's license was found in the aircraft wreckage, along with ID belonging to 78-year-old pilot Miguel Pérez. Shortly before the crash Rivera's makeup artist, Jacob Yebale, posted an image to Instagram. 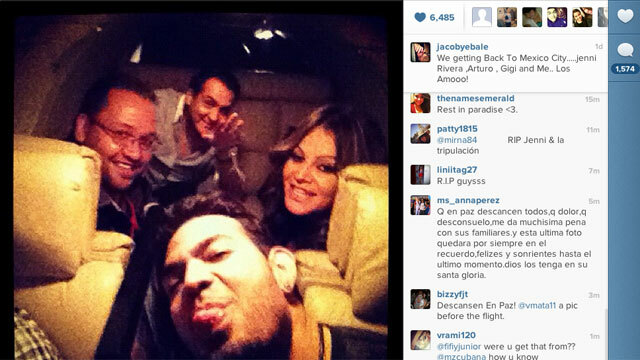 "We getting back to Mexico City," he wrote of the photo, "Jenni Rivera, [publicist] Arturo, Gigi, and me… Los amo!" The star's fans have begun organizing tributes, including a memorial service in Lynwood, Calif. and one in Corona., Calif.
At a press conference held on Monday night outside the Lakewood, Calif. home of Rivera's parents, her father, Pedro, along with her brothers Juan, Lupillo, Gustavo, and Pedro Jr., expressed hope that Rivera may still be alive after all. "In our eyes, we still have faith that my sister will be ok," Juan said. "We have no confirmation of her body being recovered dead or alive...We are strong and we will continue to stay strong. We thank God for the life that he has given my sister, for all the triumphs and the successes she's had, and we expect there to be more in the future." Rivera's brother and fellow singer Lupillo echoed his brother's statement, and spoke cryptically of details that may soon come regarding Rivera's death. "There will be more things in the near future [to talk about] but we're going to make sure they're true. I ask you, from one human being to another, to let my family rest," Lupillo told reporters. "I know it's your job, but please let us rest and get through this. I promise that soon, there will be another press conference and we'll call each and every one of you to be there. " Rivera's father added that the family is "waiting patiently for the proper permissions" from the Mexican government in order to travel to Mexico to "gather more information." Gustavo Lopez, an executive vice president at Rivera's label, Universal Music Latin Entertainment (a group that includes Rivera's record label), called the singer "the Diana Ross of Mexican music." Universal Music Group also released a statement, saying: "The entire Universal Music Group family is deeply saddened by the sudden loss of our dear friend Jenni Rivera. The world rarely sees someone who has had such a profound impact on so many. From her incredibly versatile talent to the way she embraced her fans around the world, Jenni was simply incomparable. Her talent will be missed; but her gift of music will be with us always." This story has been updated as of 9:20 p.m. PST on Monday, Dec. 10, to reflect the most recent statements made by Jenni Rivera's family at a press conference.